Pastors are among the most educated people at work today, but their training is naturally more attuned to matters of the spirit than matters of business. The Minister’s MBA gives ministry leaders more confidence and ability to manage and grow their churches and organizations. 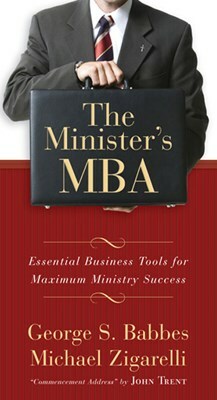 The book will also make them more conversant with the businessmen and women who serve on their various boards and committees.Easy-to-follow sections include "The Admissions Exam: Test Your MBA-Q," "Core Curriculum, "Electives," and "Graduation Day." Michael Zigarelli is an associate professor of management at Charleston Southern University and former dean of the Regent University School of Business. He holds degrees from Rutgers (Ph.D.), Cornell (M.A. ), and Lafayette College (B.A.). His research in management, practical theology, law, and ethics has appeared in numerous scholarly journals, and he has authored ten books including The Minster's MBA, Influencing Like Jesus, Management by Proverbs, and Cultivating Christian Character. Dr. Zigarelli lives with his wife and four children in South Carolina.